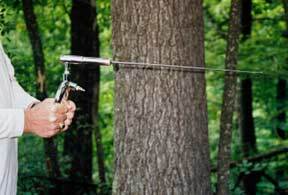 The PMR II is a specifically designed dowsing rod or as some call it a divining rod, for the treasure hunter, both professional and beginner. 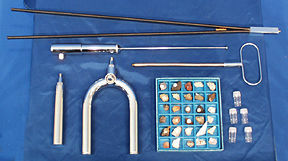 The PMR II is developed along the same lines as the Precision Master Rod as it also uses a small amount of radiant energy mineral ore to stimulate the crystals in the power tube making an accurate instrument for establishing locations and depths for metals and minerals plus other improvements making it an entirely new instrument. The PMR II uses in its power tube a powerful combination of mineral crystals, together with a radiant energy stimulant. We believe that you will be amazed at the results you get with this instrument. The PMR II is second only to the PMR III. The unique two-handed bearing handle allows for perfect balancing of the instrument for steady operation and optimum results. To use this new two handed handle, hold it as shown in the adjacent photos with the power tube level. Initial reports from customers using the PMR II with this two handed handle are enthusiastic. This handle contains two sealed bearings on which the instrument pivots so it can turn in a practically friction-free manner. Of course, the PMR II comes with the bearing handle for one-handed operation. While this power tube is very strong remember that the most important factor if getting a strong dowsing reaction is the field is to get as close to your item of search as you can. There is no other comparable dowsing instrument to the PMR II, as you will discover when it is in your hand. To use the PMR-II with either of the two bearing handles, just load the power tube with a sample of the metal or mineral for which you wish to search, extend the antenna and hold as shown in either of the pictures. When held in this manner, the instrument can swing freely right or left in the direction of your treasure or mineral deposit. 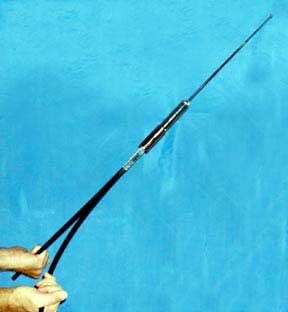 The PMR-II is operated with the 24" fibre handles and the spring handle in the same manner as the Precision-Master Rod. The PMR-II can be used to search for gold, silver, diamonds, lead, copper, mercury or any other metal or mineral. The user response and praise of this equipment has been extremely satisfying for us. It is our opinion that any serious treasure hunter should have an instrument of at least this capability in his tool kit. 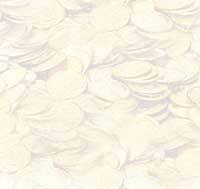 Chances are that the first treasure you unearth will more than justify the modest cost. The PMR-II is one of the finest dowsing instruments build and in performance is second only to the PMR-III. The instruments of the PMR Series are the only dowsing instruments that use a radiant energy mineral ore to stimulate the power load. The price of this instrument is $2,095 complete with all accessories shown, including both one-hand and two-hand bearing handles, spring handle, 24" fibre handles, gold and silver samples, mineral sample set and comprehensive operating instructions. You may send cash, check, money order or charge it to your credit card. This instrument is unconditionally guaranteed for 10 years. If any service or repair is required during this period, it will be performed free of any charge. The PMR-II is sold on a 30-day trial money-back guarantee. If it does not perform exactly as advertised, return it in good condition and your money will be immediately refunded.